San Diego stepped into the forefront of innovation, research and transformation of the future of healthy aging this November by hosting the inaugural session of the UCSD Think Tank on Healthy Aging, part of the UC San Diego School of Medicine’s Stein Institute for Research on Aging. The Think Tank’s purpose is to bring a diverse group of experts from many disciplines together to brainstorm on how our society can and should face the challenges of the aging in our society. On Sunday, November 16th, the newly opened UCSD Center For Healthy Aging, established to coordinate all aging-related programs at USCD, presented a community session called “The Future of Aging: Technology, Lifestyle, Housing and Healthcare for Tomorrow,” to report the results of the three-day Think Tank. 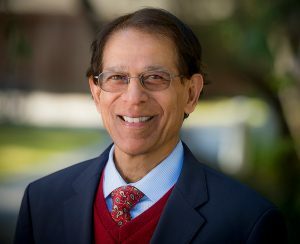 Dr. Dilip Jeste, UCSD’s senior associate dean for healthy aging and senior care, is leading the two-year initiative, and has brought together experts from around the country, and around the world, to contribute. He thinks it’s not a moment too soon to start planning, because by 2030, 1 in 5 Americans will be over 65, and by 2050, there will be 2 billion people over 65 in the world. The purpose of the Think Tank is more than simply improving medical care or curing disease. Dr. Jeste wants to lead a conversation about the way the aging will live: where they’ll live, who they’ll live with, whether they live alone or not, what role they’ll play in society, how they’ll move around, and even how they’ll interact with technology. The Think Tank’s members are expected to develop recommendations that policymakers on a national, state and local level will review and, ideally, act on, so Dr. Jeste has formed an All-Star team. Members include the scientific director of the National Institute on Aging, the CEO of the Susan G. Komen foundation and the CEO of Partners HealthCare system, in addition to several of Dr. Jeste’s colleagues from UCSD. The co-chair of the Think Tank is Dr. Dan Blazer, professor of psychiatry and behavioral sciences at Duke University, who believes that the multi-discipline approach will produce better results. The Think Tank will meet four times over the next two years and produce a final report in fall 2016. Dr. Jeste feels that the high quality of the team that forms the Think Tank will ultimately give San Diego a reputation in the field of aging in the same way that the Salk Institute established San Diego in biological research. San Diego’s aging population benefits in other ways, since researchers will undoubtedly want to test out some of the recommendations locally in pilot studies. “You’ll see San Diego as the forum for the national and international initiatives,” Dr. Jeste told the U-T, and his co-chair Dr. Blazer agreed. “This will be specifically relevant to elders in San Diego,” Dr. Blazer said, and the lessons learned in San Diego could be applied on a larger scale.